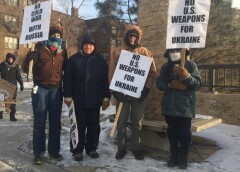 Peace vigil in Twin Cities opposes U.S. military intervention in Ukraine | Fight Back! St. Paul, MN - 15 people braved the cold and wind to say no Cold War with Russia and no U.S. weapons to the Ukraine, Feb 18. The vigil took place on the Lake Street Marshall Avenue Bridge over the Mississippi River between Minneapolis and Saint Paul. The weekly peace vigil was sponsored by the End War Committee of Women Against Military Madness and Twin Cities Peace Campaign. The Feb. 18 vigil was endorsed by Anti-War Committee, Minnesota Peace Action Coalition and others.